I’m not sure whether I should be mad at my ancestors or they should be mad at me. My reason for being mad at them is that we have pulling almost 16 pounds of nails out of the recycled timbers that will go into The Thoughtful House in the last few days. This is in addition to several shopping bags full of nails that we extracted when we dismantled a log cabin that has been in my family for five generations to reclaim the timbers for the construction of The Thoughtful House. My ancestors’ justification for being mad at me would be that we have pulled out all of the nails that they so diligently pounded in during construction of the cabin and modification of it over those five generations. Our nail party brings up the main down side of using reclaimed timbers for new construction. Nails have to be extracted from reclaimed wood before it can be used because they nick and dull saws. 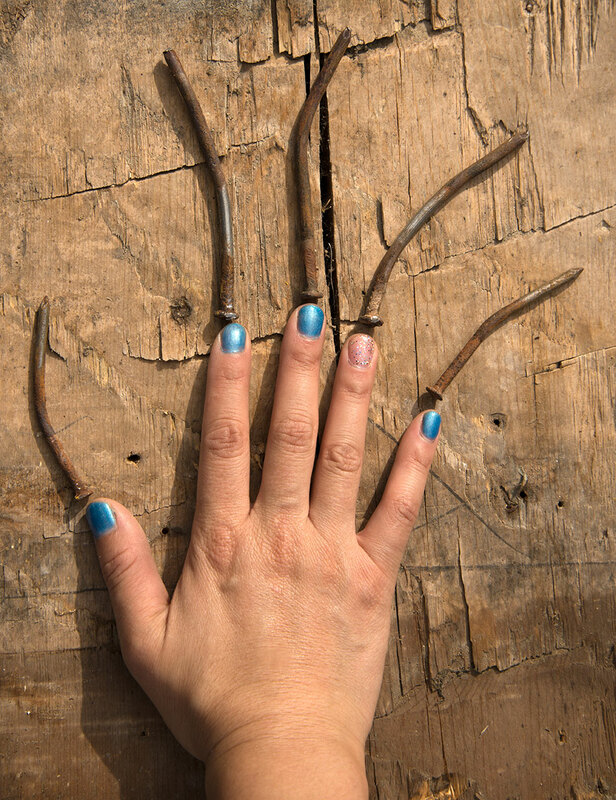 The photo below shows the hand of one of our nail pullers with some of the nails we extracted. 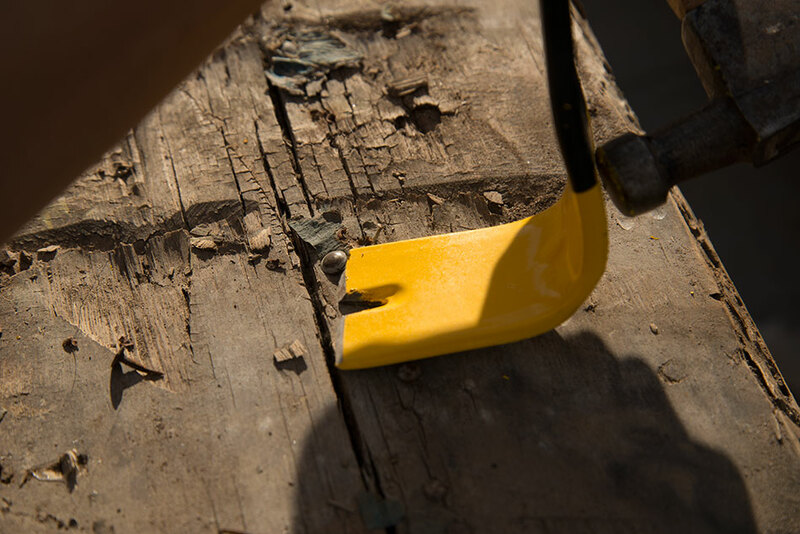 Whether you use sophisticated tools to extract nails or a crowbar, hammer and chisel, the process is the same. We first extracted all of the nails that we could see and then ran a metal detector over each log and board so we could catch the ones we had missed and dig them out. A nail is used as a fastener and can be made of metal as most of them are, or wood, such as a peg. Nails are made in a great variety of sizes and forms, from railroad spikes to tacks. We pulled out every imaginable size from our logs. They are representative of the nails that were available during the 19th and 20th centuries, when nail technology progressed more rapidly than in any other time period. Nails have been used for thousands of years. Bronze nails were used in Egypt as early as 3400 B.C. The Bible refers in several places to the use of nails, the most well known being the crucifixion of Jesus Christ. Long before that, the book of Judges preserved accounts of a woman driving a nail into the temple of an enemy commander while he was asleep and killing him and the use of iron and gold nails in Solomon’s temple, and Isaiah spoke of nails as a symbol of Israel's ancient covenant with their Messiah. The term penny was used in connection with nails as early as medieval times, when nails were used informally as an exchange medium and great care was taken to recover them from old buildings to reuse them. Nails were made by hand and households, including that of Thomas Jefferson, often made their own nails. The United States still designates nails by their penny size, with a larger number indicating a longer nail. 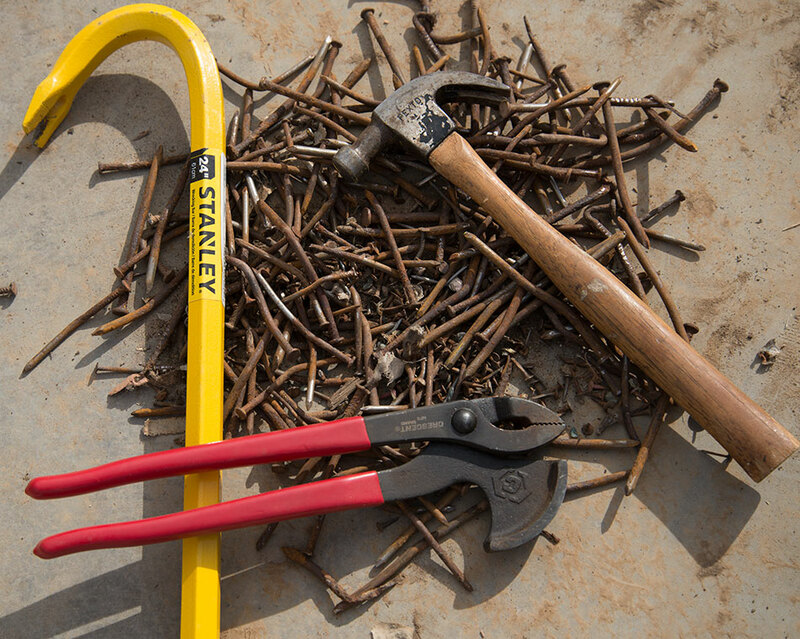 Until the 19th century, most nails were hand-wrought or forged by artisan nailers working with slitters, who cut iron bars into pieces for the nailers to use. The nailers were basically blacksmiths. Handwrought nails were created by heating iron ore with carbon to create wrought iron and shaping it into square rods. A blacksmith then would heat a rod, taper it, cut off the taper and insert it into a nail heading tool that had a square hole. The top of the taper was hammered down, forming a head. Surprisingly, even though the lumber we were dealing with was from a cabin built in the 1880s, we found two or three of this type of nail. This is probably because handwrought nails continued to be used for shoeing horses long after they fell out of general use in the early 1800s. 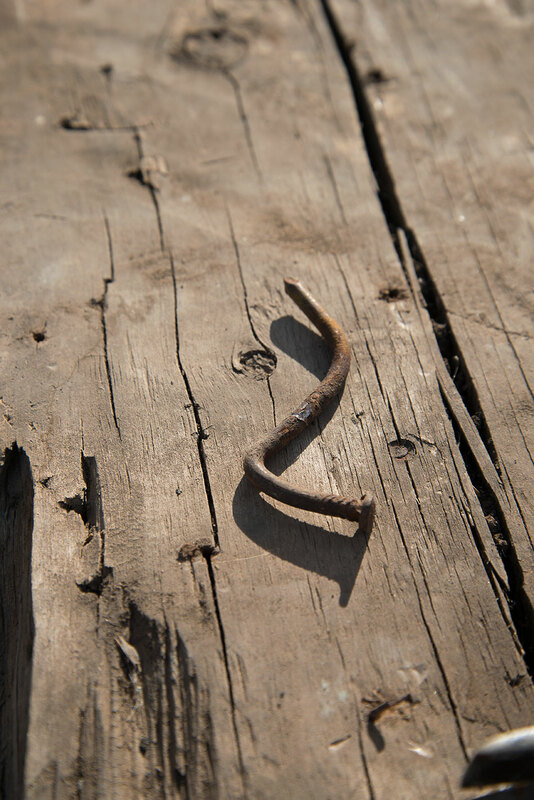 The cabin from which our timbers came was on a ranch where it was common to shoe horses, and they may have used this type of nails in the cabin because they happened to have some on hand. The making of cut nails, which were commonly used from 1800 to 1914 and are still manufactured in smaller numbers for specialty uses, was automated in the 18th century. Because of the development of this type of nail, the use of wooden joints in timber framing declined. Many of the cabin's nails were in this form, although wooden pegs were also used to anchor the roof to the walls of the cabin. Cut nails were cut from sheets of iron so that their iron fibers ran down the nails. The cut nail industry grew until the 1860s, after which it declined because of competition from wire nails. Wire nails, also known as French nails, became popular in the mid-19th century and the majority of the nails in the cabin are of this type. They made possible the almost complete automation of nail making. By 1913, 90% of manufactured nails were wire. Because of the development of wire nails, nails went from being a precious commodity to a cheap mass-produced one within two generations. Today, most nails are made of steel. Wood nails are made of a soft form of steel and those used in concrete are harder steel. Nails come in a huge variety of sizes, lengths and composition, depending on their use. 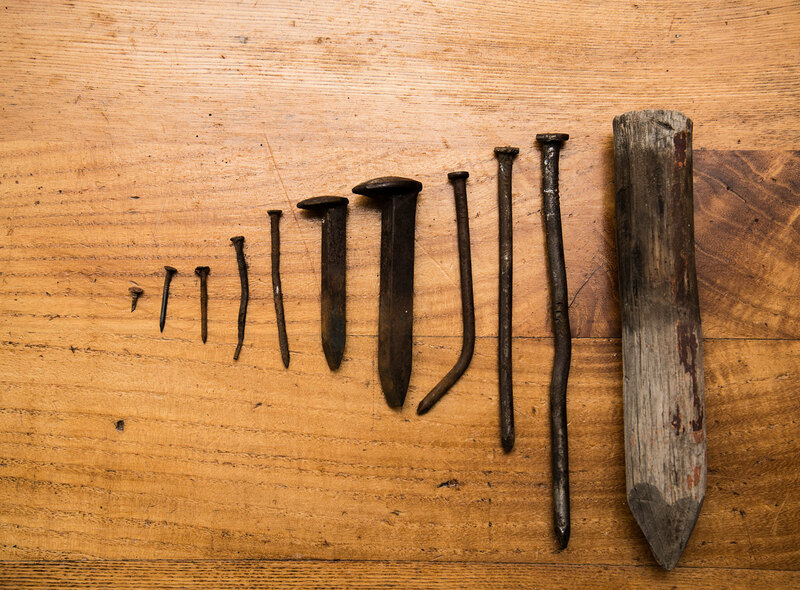 In the case of our cabin, the nails ranged from small tacks of various sizes and types that were used on the inside of the cabin to anchor wall paper, up to one nail that was as long as a pencil, a number of railroad spikes in three different sizes and thick wooden pegs about two inches in diameter. The nails in between included hand-wrought nails, square cut nails and many round wire nails of different sizes. Nails are one of the best ways to help determine the age of a historic building because a timeline can be made of nail-making technology and types of nails, especially for the 19th century. In our case, we know from other sources that the cabin was built in the mid-1880s, so we didn't have to rely on nail technology to date it.